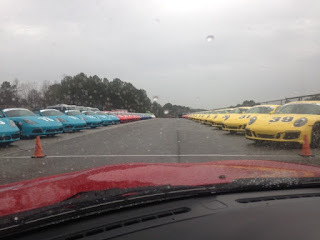 This Sunday, Team Coronautski headed down to Alabama, just outside of Birmingham, to Barber Motorsports Park. Ahead of the 24 Hours of Lemons race in February, we needed to confirm the transmission was working again, the changes to the cooling system were actually keeping the engine cool, get Jason behind the wheel of the Coronet, and get all of us a look at a new track. The Miata tucks riiight under the Cornet to save parking space. We just managed to get a canopy setup in time for the drizzle and rain that poured all morning and into the lunch break, so we mostly hung out and stayed dry when not driving instead of roaming around and getting cool photos. It's a very nice facility and home to a FLEET of Porsche cars of all kinds for the Porsche Sport Driving School. Very impressive. Two of the three rows or Porsche cars parked in paddock. There were cars of all kinds, but all of us were really hoping to see this prototype car hit the track. Unfortunately, the rain kept him parked. 1000cc motorcycle engine? Pulls 2Gs in the corners? Sounds good to me! Throughout the day several drivers managed to wipe out in the wet conditions that saw some significant standing water, but all of us kept the cars on track and had a very successful day. To finish first, first you must finish. The Coronet zips down the front straight at Barber. The Miata was fantastic on the Toyo tires I have and after a month at the body shop, the new hard top fit and did a great job of keeping me dry and safe. It's a bit of an ugly Christmas sweater look (green top on a red car), but it does the trick and it may get a paint job in the future. Kyle takes a student out in my car for some wet instructor laps. 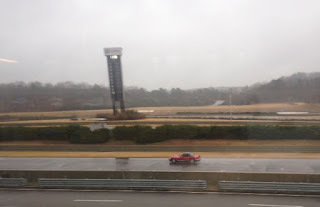 In conclusion, Barber Motorsports Park is an extremely fun track with some challenging corners and elevation changes. The Coronet is back and better than ever. We're seeing more power, more cooling, more reliability, and it's even got brand new safety belts. The Miata is still a blast to drive and I'm looking forward to some additional upgrades over the winter and a race in the Coronet in February. My car and Jason's car hanging out in Paddock.